Stunning,views, peaceful location, superb accommodation all add up to a relaxing stay at Burleigh Mead: Conveniently situated between the town centre and Lake Derwentwater - you needn't look any further for your ideal place to stay. Burleigh Mead occupies an enviable position on The Heads, possibly the finest location in Keswick. The town centre is a short, level walk away, whilst in the other direction a stroll through Hope Park takes you past the highly acclaimed 'Theatre by the Lake' and down to the shores of Derwentwater. If you're feeling energetic carry on to Friars Crag for a spectacular view of the 'Jaws of Borrowdale' then continue around the lake. 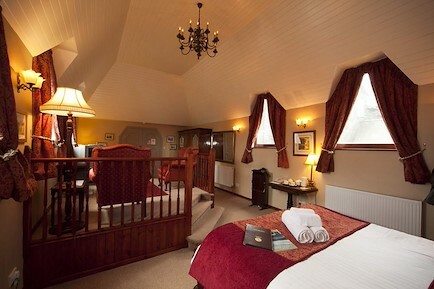 All our individually styled bedrooms are bright and spacious. Each has digital flat screen television with Freeview, hairdryer, complimentary beverage tray and a selection of toiletries in the newly refurbished en-suites. Easy chairs are provided for your comfort whilst relaxing in the room. In addition to our standard en-suite rooms we have the Burleigh Suite; an elegant south facing, extremely spacious room offering delightful panoramic views over Hope Park to the fells beyond. Tastefully decorated with a comfortable seating area, large en-suite and king size bed - the Burleigh Suite is perfect for that special occasion. A guest lounge is situated on the ground floor adjacent to the south facing dining room where you can enjoy a leisurely breakfast and marvel at the wondrous views stretching out across Hope Park, to the fells beyond Derwentwater and further still, to the Borrowdale valley and distant Glaramara. For those of you who wish to enjoy our incredibly beautiful scenery without moving too far, our garden with patio provides the right setting for doing just that. Burleigh Mead is 20 minutes from the M6 motorway: leaving the motorway at Junction 40, take the A66 into Keswick and then follow the signs for Borrowdale and The Lake. The Heads is across from the central car park and Burleigh Mead is 100 yards from the start of the road on the right. Your enquiry will be sent directly to Burleigh Mead. Please fill in as much detail as you can.